Is it silly that I'm nervous? Taking photos and especially POSTING photos of myself is just a little nerve wracking! Anyway, gulp, here goes. One of my goals for this year was to sew more for myself. I've "experimented" in sewing for myself before. Meaning I've sewn stuff, without patterns, and it was always pretty much a failure. I've made a few skirts that turned out ok, but just... ok. 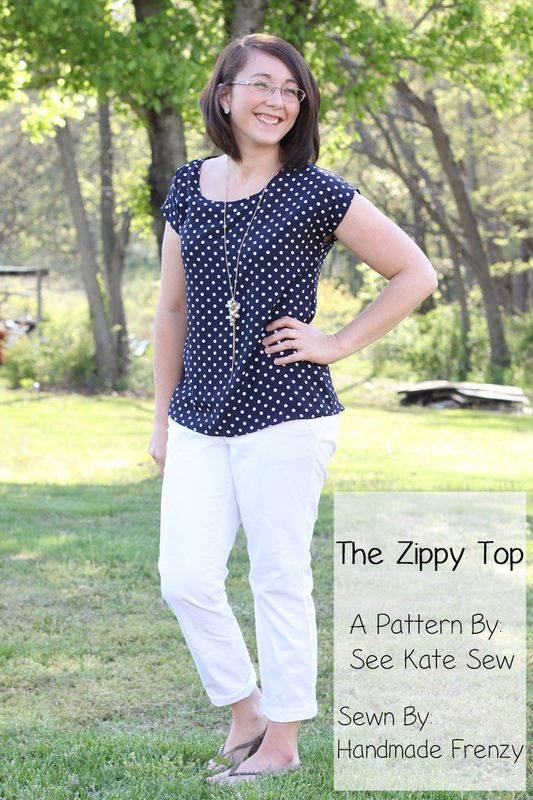 So I was VERY excited when Kate came out with the Zippy Top pattern! It was pretty much like she looked inside my head, read my thoughts, and created this pattern! With an added bonus... the zipper! No joke, I had two shirts that I purchased at a store last year, wore them to death, and then shrunk them in the dryer. *Sigh* I loved those shirts, but I had a few complaints. They were too short, and the necklines were too big, they kept slipping off of my shoulders and I was forever pulling them up to hide my bra straps. So I had thought, well, I'll just cut one of them up and create a pattern from them with a few modifications... Enter in the Zippy Top, all the work is done for me! Yes PLEASE!! And it was like it was made for ME. 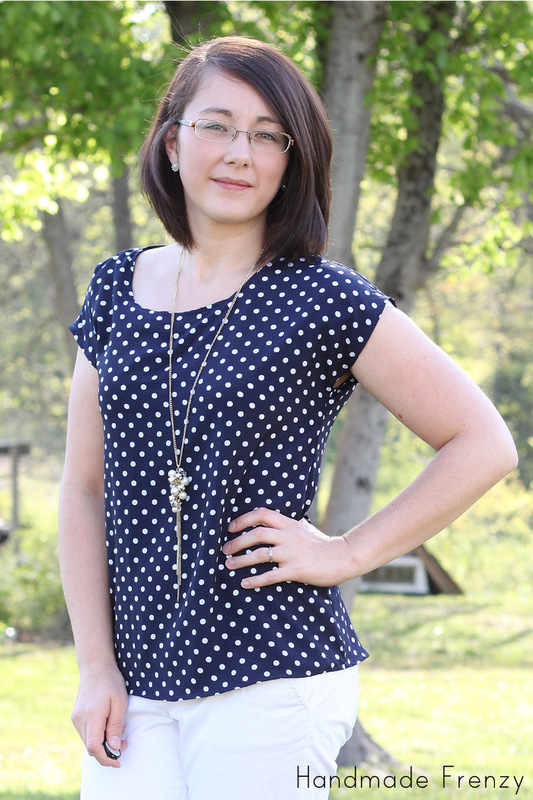 The neckline is perfect, the length is perfect, and I LOOOOOVE zippers! I love that this shirt covers in all the right places and is still cool enough to enjoy all summer. I've heard some concern that the shirt is short, based on versions out there in blogland. I am 5' 3" and I made the size S. The length is exactly what I wanted! It's long enough to keep my back covered when bending over and chasing the munchkins, but not so long that it's tunic length. There is no need to layer a tank under it, which is great for me because our summers get so hot here. I used a peachskin fabric from fabric.com. The description says that it is semi sheer, but that is not my experience, there is no sheerness at all, which I love. Again, no need to layer! It was a bit slippery and tricky to work with, but I took my time and it was so worth it. 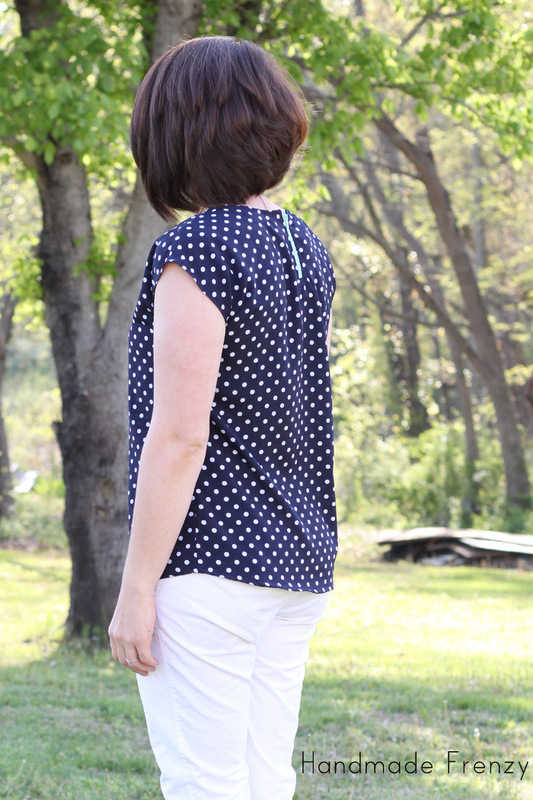 The drape is perfect for the boxy shape of the shirt! Because the fabric frays very easily I used french seams to finish and it worked perfectly. And I also followed all of Kate's tips she shared here about how to work with chiffon, they worked fabulously with this fabric as well. I tried the shirt on over my head before putting in the zipper and found that there really is no need for the zipper to get the shirt on. Bonus for if you want an even quicker and easier shirt to sew! 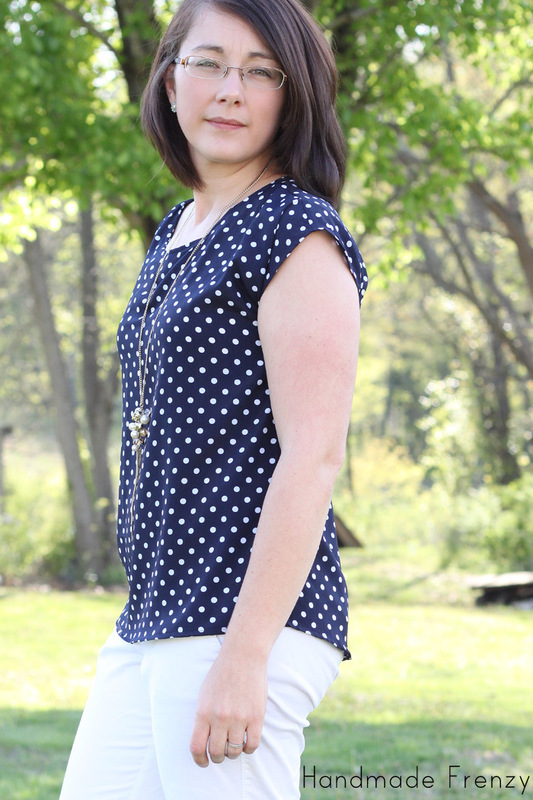 I kind of love polka dots. And navy. And green. Especially mint green. So I love this shirt! And another awesome thing is how I can dress it up or down. 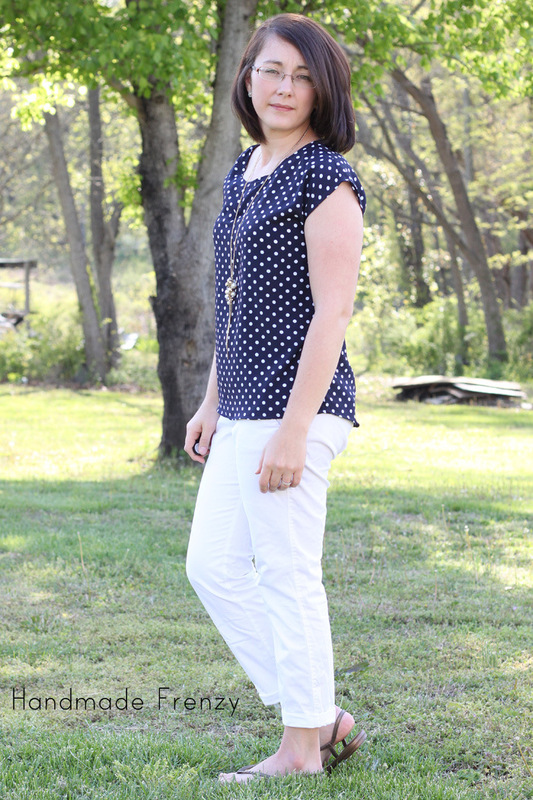 This outfit is great for a date or even church or a girls night. Right after this photo shoot I took off the necklace and changed into denim bermudas and ran to the store for groceries. Yay for versatility! I have at least 3 more cuts of fabric I plan to use to make that many more zippy tops! 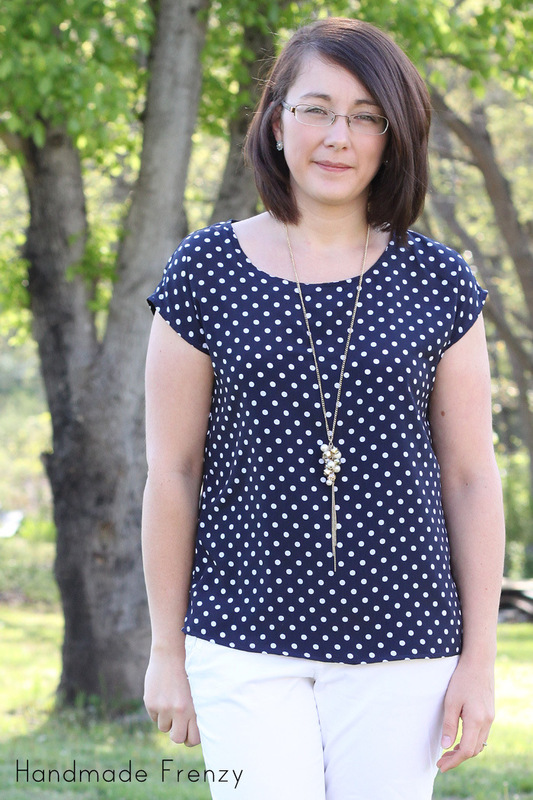 The best part is you only need 1 - 1 1/2 yds of fabric for this top. I lived in my two last summer and can't wait to have FOUR in my closet for this summer. 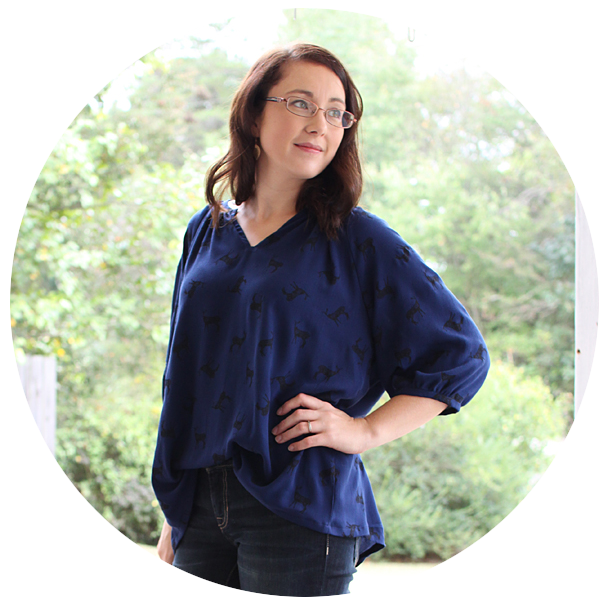 In summary, I totally love this top, especially in this drapey fabric. I can't wait to try it in a knit too! Yay...you look beautiful and that top is great! I love the little zipper detail in the back! I had some doubts about this top, but you look so great in it!!! 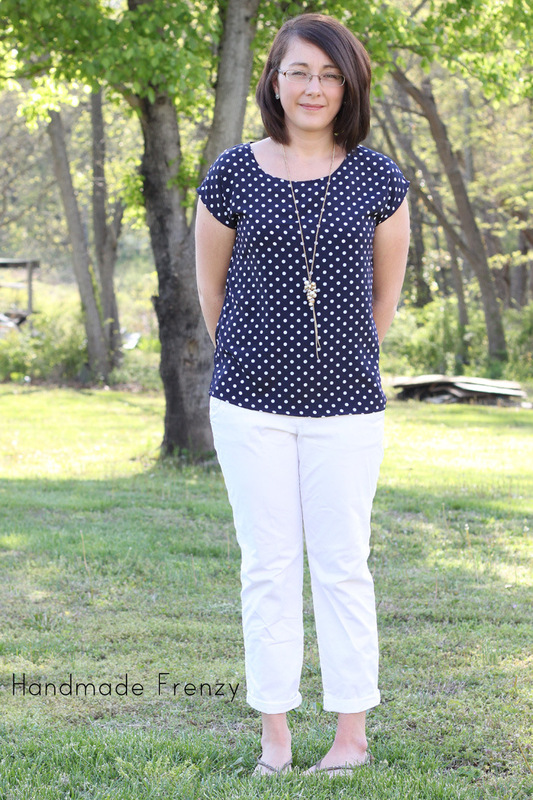 Fits perfectly and love the polka dots. Thanks Renee! It's so comfy too! Yay!!! So happy to hear that :) And thank you! You all definitely made my day with the sweet comments! Heidi, the top and you look amazing! 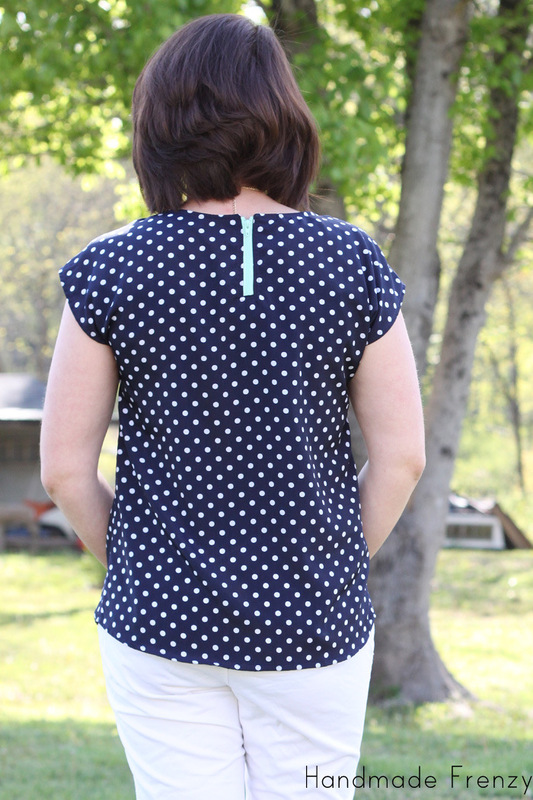 The length is great on you and I also love polka dots! You look so cute! You did a great job modeling! I love this top on you - especially the surprise green zipper in the back. Just lovely. 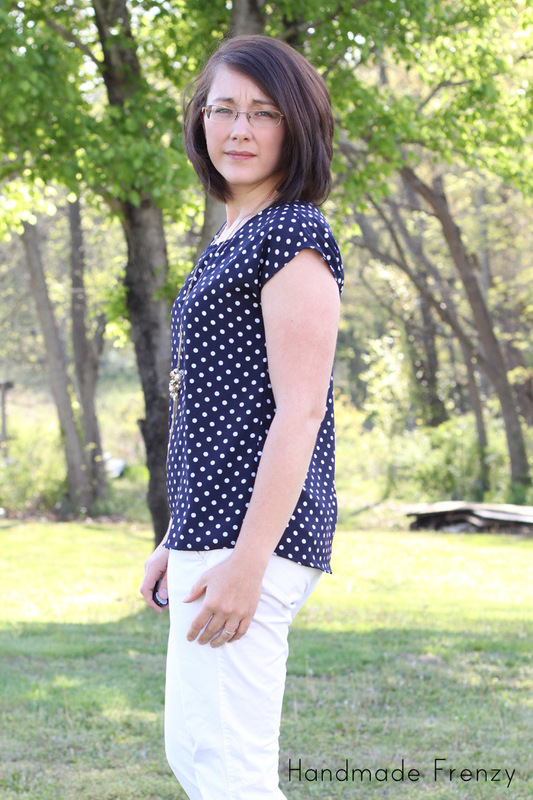 I just came over here from Rae's blog because I love this top! Great job. Definitely going to check out the pattern for myself. Oh my gosh this top is perfect! And you look gorgeous! Awe, thanks so much Emily! !